This volume covers the known details of all subtypes of occult spinal dysraphism in unprecedented detail. This 21 chapter invaluable resource begins with a deep dive into the history and embryology of occult spinal dysraphisms. Following this, subtypes of occult spinal dysraphism are thoroughly explored ­­― of which include split cord malformations, tethered cord syndromes, adult presentations/outcomes of occult spinal dysraphism, cutaneous stigmata. Chapters will cover the clinical presentation, radiological features, and surgical nuances of each of the occult spinal dysraphisms. Throughout the book, expertly written text is supplemented by a number of high quality figures and tables, as well as a video documenting surgical treatment of type 1 split cord malformation. The hypointensity can be delineated further in the gradient echo sequence T2* images due to hemosiderin deposition in and around the cavernous malformation 1) 2). The T2-weighted image show a cavernous malformation as heterogeneous and “popcorn-like” with a mixed signal intensity core and a hypointense hemosiderin rim. T2WI and T2* gradient echo show multiple cavernomas. Notice the popcorn appearance with peripheral rim of hemosiderin on the T2WI. The lesions are almost completely black on the gradient echo due to blooming artefacts. 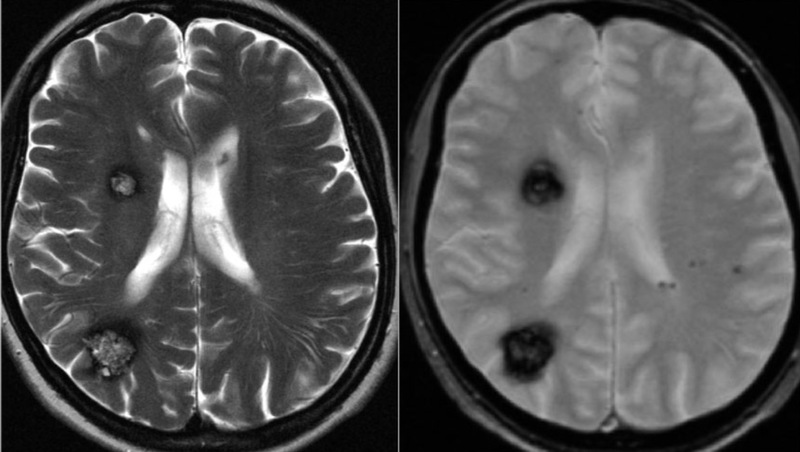 T2* and susceptibility weighted imaging (SWI) markedly increase the sensitivity of MRI to detect small cavernomas. The five black dots in the left cerebral hemisphere on the T2* are also cavernomas and are not visible on the T2WI. Based on the currently available data in 2017, Dammann et al., concluded that if surgical treatment of cavernoma-related epilepsy is performed, the peri-lesional hemosiderin should be resected. However, cases of eloquent or multiple localization or widespread hemosiderin deposit in which a complete resection is challenging should undergo a specific preoperative work-up 3). The functional-based resection using intraoperative functional brain mapping allows safe resection of CA and the peripheral hemosiderin rim located within or close to eloquent brain areas 4). An online survey composed of 61 items was sent to 26 centers to establish a multicenter international retrospective cohort of adult patients who underwent a surgical resection as the first-line treatment of a supratentorial cavernous angioma located within or close to eloquent brain area. 272 patients from 19 centers (mean 13.6 ± 16.7 per center) from eight countries were included. The pre-operative management varied significantly between centers and countries regarding the pre-operative functional assessment, the pre-operative epileptological assessment, the first given antiepileptic drug, and the time to surgery. The intra-operative environment varied significantly between centers and countries regarding the use of imaging systems, the use of functional mapping with direct electrostimulations, the extent of resection of the hemosiderin rim, the realization of a post-operative functional assessment, and the time to post-operative functional assessment. The present survey found a post-operative improvement, as compared to pre-operative evaluations, of the functional status, the ability to work, and the seizure control. They observed a variety of practice between centers and countries regarding the management of cavernous angioma located within eloquentregions. Multicentric prospective studies are required to solve relevant questions regarding the management of cavernous angioma-related seizures, the timing of surgery, and the optimal extent of hemosiderin rim resection 5). In ten studies comparing extended hemosiderin excision with only lesion resection were identified by searching the English-language literature. Meta-analyses, subgroup analyses and sensitivity analysis were conducted to determine the association between hemosiderin excision and seizure outcome after surgery. Patients who underwent extended surrounding hemosiderin excision could exhibit significantly improved seizure outcomes compared to patients without hemosiderin excision. However, further well-designed prospective multiple-center RCT studies are still needed 6). Previous works showed that extent of resection and its surrounding hemosiderin rim were found to consistently correlate with a more favorable post-operative seizure-free outcome 7) 8). Patients with short duration of epilepsy associated with cavernous malformations could benefit greatly from complete resection of hemosiderin rim and cavernous malformations 9). High field intraoperative MRI imaging (iopMRI) and neuronavigation might play a crucial role to achieve both goals 10). 26 patients (14 female, 12 male, mean age 39·1 years, range: 17-63 years) with CM related epilepsy were identified. Eighteen patients suffered from drug resistant epilepsy (69·2%). Mean duration of epilepsy was 11·9 years in subjects with drug resistant epilepsy (n = 18) and 0·3 years in subjects presenting with first-time seizures (n = 8). 24 lesionectomies and two lesionectomies combined with extended temporal resections were performed. Seven lesions were located extratemporally. Complete CM removal was documented by postsurgical MRI in all patients. As direct consequence of iopMRI, refined surgery was necessary in 11·5% of patients to achieve complete cavernoma removal and in another 11·5% for complete resection of additional adjacent epileptogenic cortex. Removal of the hemosiderin rim was confirmed by iopMRI in 92% of patients. Two patients suffered from mild (7·7%) and one from moderate (3·8%) visual field deficits. Complete seizure control (Engel class 1A) was achieved in 80·8% of patients with a mean follow-up period of 47·7 months 11). Campbell PG, Jabbour P, Yadla S, Awad IA. Emerging clinical imaging techniques for cerebral cavernous malformations: a systematic review. Neurosurg Focus. 2010 Sep;29(3):E6. doi: 10.3171/2010.5.FOCUS10120. Review. PubMed PMID: 20809764; PubMed Central PMCID: PMC3708641. de Champfleur NM, Langlois C, Ankenbrandt WJ, Le Bars E, Leroy MA, Duffau H, Bonafé A, Jaffe J, Awad IA, Labauge P. Magnetic resonance imaging evaluation of cerebral cavernous malformations with susceptibility-weighted imaging. Neurosurgery. 2011 Mar;68(3):641-7; discussion 647-8. doi: 10.1227/NEU.0b013e31820773cf. PubMed PMID: 21164377. Dammann P, Schaller C, Sure U. Should we resect peri-lesional hemosiderin deposits when performing lesionectomy in patients with cavernoma-related epilepsy (CRE)? Neurosurg Rev. 2017 Jan;40(1):39-43. doi: 10.1007/s10143-016-0797-5. Epub 2016 Nov 8. Review. PubMed PMID: 27822594. Zanello M, Goodden JR, Colle H, Wager M, Hamer PCW, Smits A, Bello L, Tate M, Spena G, Bresson D, Capelle L, Robles SG, Sarubbo S, Rydenhag B, Martino J, Meyer B, Fontaine D, Reyns N, Schichor C, Metellus P, Colle D, Robert E, Noens B, Muller P, Rossi M, Nibali MC, Papagno C, Galbarritu L, de Gopegui ER, Chioffi F, Bucheli C, Krieg SM, Wostrack M, Yusupov N, Visser V, Baaijen JC, Roux A, Dezamis E, Mandonnet E, Corns R, Duffau H, Pallud J. Predictors of Epileptic Seizures and Ability to Work in Supratentorial Cavernous Angioma Located Within Eloquent Brain Areas. Neurosurgery. 2019 Mar 29. pii: nyz063. doi: 10.1093/neuros/nyz063. [Epub ahead of print] PubMed PMID: 30924504. Zanello M, Meyer B, Still M, Goodden JR, Colle H, Schichor C, Bello L, Wager M, Smits A, Rydenhag B, Tate M, Metellus P, Hamer PW, Spena G, Capelle L, Mandonnet E, Robles SG, Sarubbo S, Martino González J, Fontaine D, Reyns N, Krieg SM, Huberfeld G, Wostrack M, Colle D, Robert E, Noens B, Muller P, Yusupov N, Rossi M, Conti Nibali M, Papagno C, Visser V, Baaijen H, Galbarritu L, Chioffi F, Bucheli C, Roux A, Dezamis E, Duffau H, Pallud J. Surgical resection of cavernous angioma located within eloquent brain areas: International survey of the practical management among 19 specialized centers. Seizure. 2019 Mar 28;69:31-40. doi: 10.1016/j.seizure.2019.03.022. [Epub ahead of print] PubMed PMID: 30959423. Ruan D, Yu XB, Shrestha S, Wang L, Chen G. The Role of Hemosiderin Excision in Seizure Outcome in Cerebral Cavernous Malformation Surgery: A Systematic Review and Meta-Analysis. PLoS One. 2015 Aug 25;10(8):e0136619. doi: 10.1371/journal.pone.0136619. eCollection 2015. PubMed PMID: 26305879. Stavrou I, Baumgartner C, Frischer JM, Trattnig S, Knosp E. Long-term seizure control after resection of supratentorial cavernomas: a retrospective single-center study in 53 patients. Neurosurgery. 2008 Nov;63(5):888-96; discussion 897. doi: 10.1227/01.NEU.0000327881.72964.6E. PubMed PMID: 19005379. Kim W, Stramotas S, Choy W, Dye J, Nagasawa D, Yang I. Prognostic factors for post-operative seizure outcomes after cavernous malformation treatment. J Clin Neurosci. 2011 Jul;18(7):877-80. doi: 10.1016/j.jocn.2010.12.008. Epub 2011 May 10. Review. PubMed PMID: 21561775. Jin Y, Zhao C, Zhang S, Zhang X, Qiu Y, Jiang J. Seizure outcome after surgical resection of supratentorial cavernous malformations plus hemosiderin rim in patients with short duration of epilepsy. Clin Neurol Neurosurg. 2014 Apr;119:59-63. doi: 10.1016/j.clineuro.2014.01.013. Epub 2014 Jan 25. PubMed PMID: 24635927. Xie HW, Wang DM, Yuan QG, Sha C, Yang YM, Jiang HZ. [The utility of neuronavigation in the microsurgery for cerebral cavernous malformations]. Zhonghua Wai Ke Za Zhi. 2011 Aug 1;49(8):712-5. Chinese. PubMed PMID: 22168935. Sommer B, Kasper BS, Coras R, Blumcke I, Hamer HM, Buchfelder M, Roessler K. Surgical management of epilepsy due to cerebral cavernomas using neuronavigation and intraoperative MR imaging. Neurol Res. 2013 Oct 23:0. [Epub ahead of print] PubMed PMID: 24070413. Dorsal displacement of the facial nerve is relatively rare in patients with vestibular schwannoma. Its prediction remains difficult in patients with large tumors, even with the recent advances in preoperative radiologic assessments. Anatomic and functional preservation of the facial nerves combined with maximal tumor removal is particularly challenging in this rare anatomic variant, and surgery may lead to postoperative facial nerve paralysis, inadequate tumor removal, and/or a high retreatment rate. The 3-dimensional video (Video 1) demonstrates a vestibular schwannoma with dorsally displaced facial nerve, which was surgically treated by the retrosigmoid transmeatal approach under continuous facial nerve monitoring. The video was reproduced after informed consent of the patient. A 46-year-old man presented with transient hearing impairment. Neuroimaging displayed a left vestibular schwannoma extending into the internal acoustic meatus. The retrosigmoid transmeatal approach was performed, and a dorsally displaced facial nerve was predicted by preoperative magnetic resonance images and confirmed during surgery. The facial nerve was accurately dissected under continuous facial nerve monitoring, and gross total resection of the tumor was achieved without postoperative facial dysfunction 1). A 52-year-old male with acute loss of functional hearing on the right side. Audiometry confirmed a loss of up to 60 dB and lost speech discrimination, there were no associated symptoms such as tinnitus or vertigo. This 2D video demonstrates positioning, OR set-up, anatomical and surgical nuances of the skull base approach and the operative technique for microdissection of the tumor from the critical neurovascular structures, especially the facial and cochlear nerves. A gross total resection was achieved and the patient discharged home after four days with unaltered function of the facial nerve (HB I). At one year follow up there was no indication of residual or recurrence. In summary, the retrosigmoid transmeatal approach is an important and powerful tool in the armamentarium for the microsurgical management of all kinds of vestibular schwannomas. Provided the necessary anesthesiological precautions and intraoperative procedures the semi-sitting position is safe and effective. If needed, the approach can be complemented by the use of an endoscope for visualization of the distal internal auditory canal. The link to the video can be found at: https://youtu.be/pPKT4_5nIn0 2). The anterior inferior cerebellar artery (AICA) usually runs loosely within the cerebellopontine cistern; in rare cases, however, it is firmly adherent to the petrous dura mater. Recognizing this variation is particularly important in vestibular schwannoma surgery via the retrosigmoid transmeatal approach to prevent the high morbidity associated with vascular injury. This video demonstrates a surgical technique to effectively mobilize the AICA when firmly adherent to the petrous dura mater. A 39-year-old man presented with a history of progressive right-sided hearing loss without facial weakness or other associated symptoms. Magnetic resonance imaging (MRI) demonstrated an intracanalicular lesion, suggestive of vestibular schwannoma. During follow-up, audiometryconfirmed a further slight deterioration of hearing and repeated MRI demonstrated tumor growth (T2 according to Hannover Grading Scale). Since the patient opted against radiosurgery, a retrosigmoid transmeatal approach under continuous intraoperative monitoring was performed in supine position. Following drainage of cerebrospinal fluid and exposure of the cerebellopontine cistern, the AICA was found to be firmly adherent to the petrous dura mater. Both structures were elevated conjointly and displaced medially for safe drilling of the inner auditory canal, sufficient exposure, and complete excision of the vestibular schwannoma. The patient had an excellent recovery, hearing and facial function were preserved, and no secondary neurological deficits noted.The patient consented to publication of this anonymized video 3). Matsushima K, Kohno M, Nakajima N, Ichimasu N. Dorsally Displaced Facial Nerve in Retrosigmoid Transmeatal Approach for Vestibular Schwannoma: 3-Dimensional Operative Video. World Neurosurg. 2019 Mar;123:300. doi: 10.1016/j.wneu.2018.11.261. Epub 2018 Dec 21. PubMed PMID: 30580063. Evangelista-Zamora R, Lieber S, Ebner FH, Tatagiba M. Retrosigmoid Transmeatal Endoscope-Assisted Approach in Semi-Sitting Position for Resection of Vestibular Schwannoma: 2-D operative Video. J Neurol Surg B Skull Base. 2018 Dec;79(Suppl 5):S385-S386. doi: 10.1055/s-0038-1669985. Epub 2018 Oct 9. PubMed PMID: 30473983; PubMed Central PMCID: PMC6240135. Tatagiba MS, Evangelista-Zamora R, Lieber S. Mobilization of the Anterior Inferior Cerebellar Artery When Firmly Adherent to the Petrous Dura Mater-A Technical Nuance in Retromastoid Transmeatal Vestibular Schwannoma Surgery: 3-Dimensional Operative Video. Oper Neurosurg (Hagerstown). 2018 Nov 1;15(5):E58-E59. doi: 10.1093/ons/opy052. PubMed PMID: 29617908. Editorial. Time to repair and outcome after traumatic brachial plexus injury: is sooner always better? Editorial. The opioid crisis: an opportunity to alter morbidity through the implementation of enhanced recovery after surgery protocols during spinal surgery? Does an enhanced recovery after surgery protocol change costs and outcomes of single-level lumbar microdiscectomy?